I was left with a guilty conscience, a pile of mistakes, and little else. I take care of JULIA GENTRY, my brother’s widow and the love of my life, and their daughter. I know she doesn’t want my help, but she gets it anyway. I owe her that. When another disaster hits, I’m given the opportunity to make things right. I’m taking it. I’m willing to sacrifice it all. Julia Gentry’s world fell apart two years ago when her husband died. Getting her life back on track and raising her daughter, feels like a constant battle especially when the person she holds responsible won’t give up trying to right his mistakes. Crew Gentry walked away from the girl he loved, only to return home to find her in the arms of his brother. After a life threatening end to a fight destroys his dreams, his life spirals out of control. Living everyday with the guilt that his brothers death was his fault and that the woman he loves will never forgive him. This is a first for me from this author and I swear it won’t be my last, even hours after finishing this, I’m still thinking about it. This was such a beautiful story. Crew never gave up trying to right his wrongs with Julia, no matter how many times she told him to leave he kept coming back. He adored his Niece Everleigh, and the bond between them melted my heart. 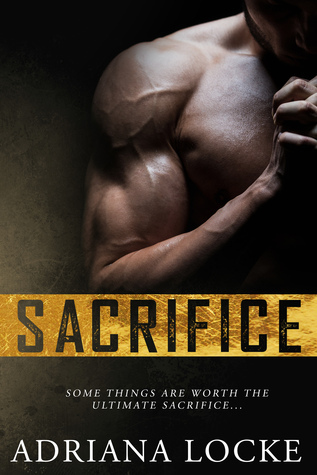 When Julia received some devastating news, Crew really stepped up to the plate, he was prepared to sacrifice everything, and I really do mean everything, to get whatever it took to make things right. The relationship between Julia and Crew was a slow burn, going from tolerating each other for the sake of Everleigh, to friends, then to Lovers. I felt like I made that journey right there along side them. I was completely submerged within the pages. You know that feeling you have when reading, that one where you have butterflies in your tummy and hope in your heart, whilst utter dread of what’s to come occupies your mind. I had that in spades from about 40% onwards, this is the first book in a while that has made me really feel and I’m so glad I took a chance and picked this baby up. I loved every word, I fell HARD for Crew, I wanted to befriend Julia, cuddle the hell out of Ever and Will. Goddamn you Adriana Locke, you better give me more Will! “You know my type: a little bit of sugar, a little bit of spice, and a hint of whore.” Will. If you‘re looking for a second chance romance, with a slow burn and bundles of emotion; this is definitely a book I’d recommend. This is a standalone novel told from Dual POV’s.